Microsoft made a new Surface Book. And it looks a lot like last year's model. The company introduced a refreshed Surface Book i7 during its hardware event in New York City, where we got a chance to play with the device for a few minutes. Microsoft told us the laptop-tablet hybrid has more battery life and an Nvidia GeForce GTX 965M GPU. It's claiming up to 16 hours of battery life in total, which is helped by a redesigned cooling system. Because of that system, the Surface Book i7 is actually heavier. 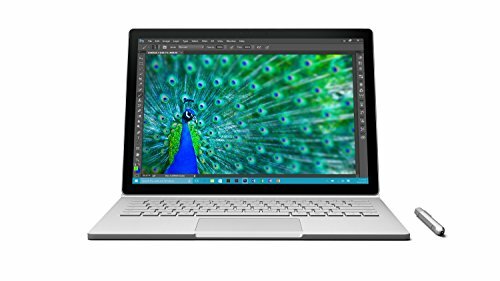 The 2016 Surface Book has been redesigned "from the outside in". It added a cooling fan and a pair of hyperbolic cooling fans at the back to keep temps down. While the trend is to go thinner and lighter every year when it comes to laptops (and mobile devices in general), Microsoft upped the weight from 3.48 pounds to 3.63 and made it slightly thicker. While the new Surface Book lacks Intel's latest Kaby Lake processors, graphics have been doubled compared to the original model. RAM also sits at 2GB. Microsoft claimed you'll get more than three times the power of the current MacBook Pro 13-inch. So, all you're getting with this update is more graphics power and battery. It's not an exactly an overhaul, to say the least. But, if it’s not broke, don’t fix it. We guess. Microsoft told us the request it received the most was to up the battery power and graphics. Instead of adding a bunch of new features, it did exactly that. Though it may be a little heavier and thicker, you don't really notice. It still looks great visually. We used it with the Pen, and the device worked smoothly. When writing with Pen, it had the feel of using a pencil on paper, but you have the ability to change what you are writing at any time and with more options. Microsoft went pretty simple here - upgrading a few things that are important to any user. However, it did add what was created for other devices, such as the Surface Studio, like the use of 3D and the Surface Dial. Though Microsoft only demoed the Dial on the Surface Studio, it does work on the Surface Book, as well as the Surface Pro 3 and Surface Pro 4. You can read more about what we thought of the Dial in our Studio hands-on. If you're in the market for the latest and greatest from Redmond, the updated Surface Book will be available on 10 November in 256GB, 512GB, and 1TB configurations. It'll cost $2,399, $2,799, and $3,299, respectively.